Bombshell Bloodbath an interview with Director Bret Mullin – Stigmatophilia's gore splattered corner of insanity. Over the past decade zombie films have undergone somewhat of a transformation, evolution to some, devolution to others and all too often in the genres contemporary offerings, gone is the possibility of subtext, gone is the very real threat of violence and decay replaced by humour, feeling and articulate zombies. In some unique cases the genre has been improved with the input of sensitivity and emotion, such as the British underground gem ‘Harold’s Going Stiff’ (2011) and AMC’s ‘The Walking Dead’ (2010-) but for every film or show driving the genre forwards there are several dragging it down as they retread the ‘Shaun of the Dead’ comedy formula or seek to bring the zombie into the mainstream and integrate the characteristics that appealing to a broad demographic requires, in particular the exclusion of violence and trash, in stark contrast to the classics of the genre. Thankfully however there are a couple of films coming in 2014 that have got me pretty excited in the lower regions but only one so far has the look and style of something that hasn’t been seen for a while, something different in this age of zombie cinema, and it is almost ironic that for me, the most forward thinking movie of the year, may be the one looking behind. Channelling the spirit of H.P. Lovecraft through Lucio Fulci it has been a long time since a film has generated so much deserved hype and this Italian style zombie film is paradoxically something fresh yet harkens back to the golden period of Italian (and arguably zombie) cinema. I am of course talking about the American-made but Italian-inspired ‘Bombshell Bloodbath’, the sensational looking directorial debut of Brett Mullin. I recently caught up with Brett to ask him about the film, his influences and what drove him to the love of Italian horror. • Bombshell Bloodbath is not a typical zombie title, what is Bombshell the film about? BM: I have always wanted to create a zombie flick. I love the genre and was originally stuck on having a film with “…of the living dead” at the bookend. It seems as though most die-hard zombie fans (including myself) expect something with undead, of the dead or zombie ____, but after the development of the flick, Bombshell Bloodbath seemed to fit perfectly. This film has some inspiration from an odd 1998 Zombie film released by Fangoria called “I, Zombie: Chronicles of Pain”. It uniquely follows a man from his transformation from human to undead. This film follows two “bombshells” in a similar manner. 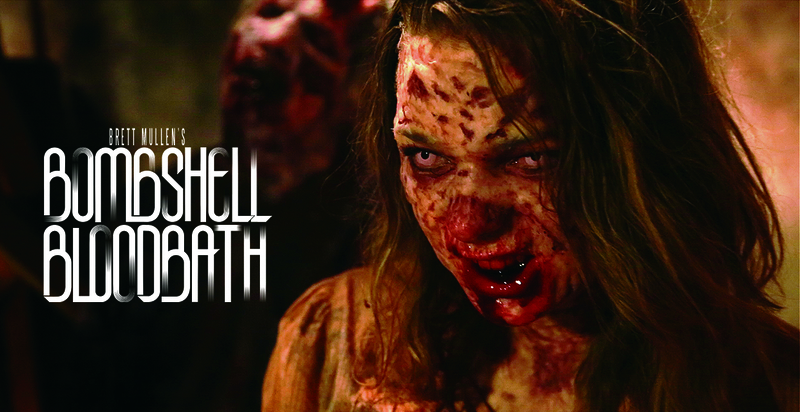 • Conceptually there seems to be a lot more going on in this film than many other horrors being made, particularly in the zombie genre, are there any themes underlying or developed throughout this film? • Dr Butcher, Dellamorte Dellamore, ReAnimator, Dead and Buried as well as a twisted take on Frankenstein all look like potential influences from the trailer, what was in your mind when you and Sky wrote the screenplay and did you have any key influences in mind? BM: I have a soft spot for all of the above films. The ORIGINAL inspiration for the Doctor in Bombshell Bloodbath however was “Dr. Frankenstein” in George A. Romero’s Day of the dead, a passionate but sloppy doctor. As the character developed he really resembles nothing of him but that is where the original inspiration came from. • The film represents your debut behind the camera, how did you find the experience? BM: I have been so busy working on it that I haven’t had the proper time to reflect just yet but I do feel very privileged to have had the opportunity to work with such an amazing cast and crew. I have also taken notes on things to improve on my next film. There is always room for improvement. • As the director and co-writer, you obviously are obviously very attached to the original shooting script, did you have to change between writer and director mode and did you manage to film exactly what you had planned or were you constantly changing? BM: This film was definitely a constantly evolving movie. Once the characters came to life in front of me, I felt as though I knew more about them and made several script changes. • You seemed to have pulled together quite an experienced and talented cast, how easy was it to sell the concept to some of them and did anyone just get it straight away? BM: I took an odd route and didn’t share the completed script with the cast. I wanted to see how they interpreted their characters by their scenes alone. The concept and the teaser trailer gained most of their trust from the beginning. • A lot of people have commented on the Italian style and keeping true to that the trailer looks extremely stylish. how did you manage to capture that look and what was so special about Italian horror to you? BM: The Italian Style Zombie Flicks are bizarre, breath-taking, bloody and bold. There is so much to take from them stylistically. I didn’t want to tell the same story in Bombshell Bloodbath that we see in every zombie flick though. It has its own set of rules and I like that about it. For instance some zombies bleed neon purple which we find out are chemicals and a human infected rotates through various eye colours before changing. I felt as though the mix of these styles would play very well. • Leading on from this, the music behind the trailer, by the mysterious Umberto, is very reminiscent of 80s Italian (and in particular zombie) movies, obviously a conscious decisions, how did you go about coming up with the music and was it vital to film in order to get this right? BM: The film is definitely heavily caked with 80′s Italian vibes which are my favourite of zombie films. I do not want fans to expect a replica of a Lucio Fulci, Bruno Mattei or Umberto Lenzi movie however. It only has influences. 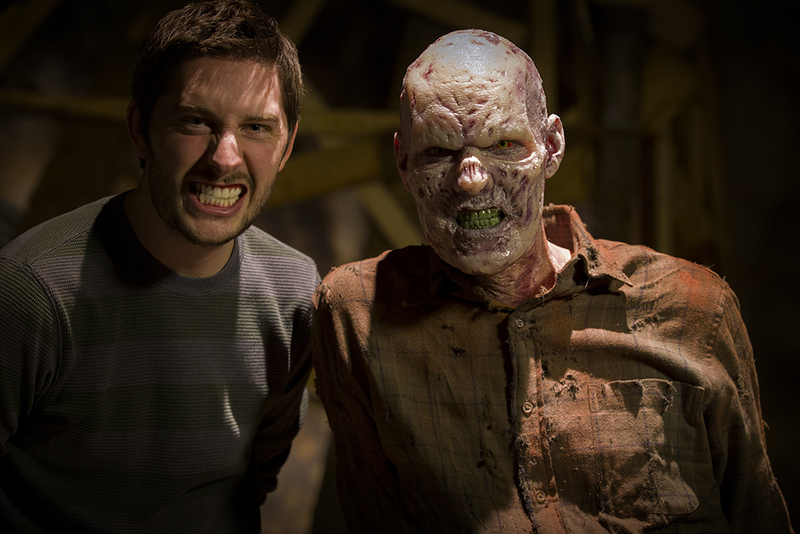 • The makeup and Fx look fantastic, rivalling the bigger budget shows and films, was this difficult to achieve and did anyone get scared on the set when facing the zombies for the first time? BM: When I originally sat down with the FX team to go over concepts for the film I repeated over and over, “Italian Style Zombies, I’d like them to be more Fulci.” When they repeated back to me “…like the Beyond?”, I knew I was in good hands. Fulci Zombies are gritty and caked in FX, I love the look. I truly feel the film wouldn’t be what it is without Joh Harp and Amber Michael (Joh Harp FX). To answer your second question… Yes. I personally jumped the first time our lead zombie Donald stepped onto set. Let’s just say it caught me off guard how good he looked. • When can we expect to see the movie out on DVD/Blu Ray in the UK and the US? BM: The film is had just wrapped post-production last month and is going to several film markets for distribution. I’m just as anxious to find out when it will be released. • And now for the big question, is there a cameo by a bottle of J&B anywhere? BM: I needed to save a big surprise in case a sequel is made. A J&B cameo could do it. Blessed with an amazing soundtrack, fantastic Fx and gore we hope you are as excited for this as we are and while holding out for the right deal to bring the film to this side of the Atlantic, I am certain we won’t have to wait too long. To keep up to date follow the film on Facebook. ‹ Spaghetti Splatter Star Giovanni Lombardo Radice is back in new Giallo The Three Sisters.